In our quest to eat healthier, Brian and I have decided to start making muffins as a healthy snack in our lunches. This may not sound radical, BUT, we work literally work right next to a Tim Horton's. When you feel the need for a snack ... Tim Horton's muffins can be irresistible. So despite eating healthy homemade meals now, we both occasionally find ourselves sneaking out to devour muffins. For my American readers Tim Horton's is like the Canadian Duncun Donuts. So us trying to wean ourselves off double-doubles and muffins is pretty much spitting on the Canadian flag, giving up our citizenship and slapping a beaver across the face. 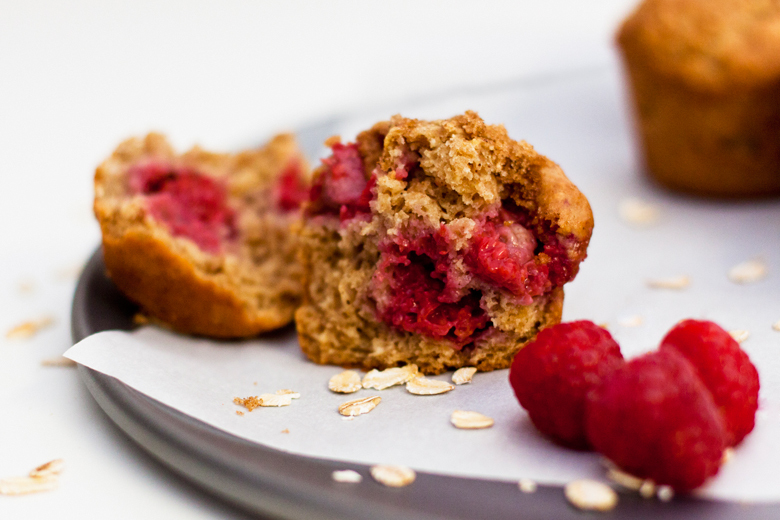 Making these muffins is our version of sticking it to the man... deliciously. Also, we both like raspberries. Alright sorry about the rant, for the actual muffins I got the recipe from cooks.com. I read the recipe, made my own changes with ingredients I had available (mainly light cream instead of buttermilk). Anyways they turned out perfectly and remember it's only healthy if don't eat all the muffins in a day. Hope you enjoy! and vive la revolution! In one bowl, combine oats and lightcream; let stand 5-10 minutes. In another bowl, mix flour, baking soda, baking powder and cinnamon. Beat eggs, stir in brown sugar and oil. Blend. Stir in oats mixture, then flour. Gently fold in fruit. Before baking make a brown sugar and cinnamon mixture to put on top of the muffins (1/2 tsp cinnamon and 1 tablespoon brown sugar... or to your taste). Bake at 370°F. for 20-25 minutes. Let cool 10 minutes before removing from muffin tin.